On this bracing early March morning, the snow is glistening and the sky is deep blue. It’s -11 degrees Celsius. My nose would be running, except the snot freezes along the edges of my nostrils. 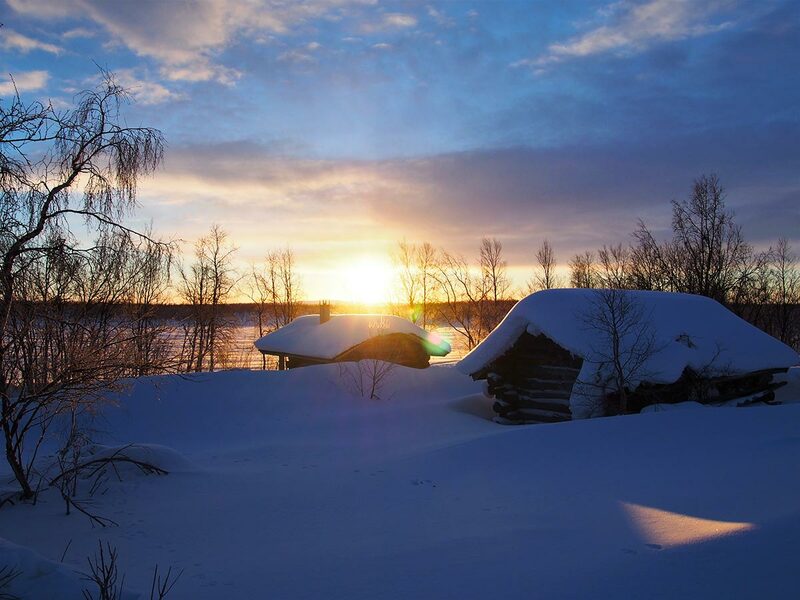 It’s day three of a five-day dogsled adventure across part of the Arctic Circle in Finland. Getting here from California involved 15 hours of flights and layovers, one night in the Finnish capital of Helsinki and a two-hour commuter flight to Kittila; then, after overnighting there, a two-and-a-half-hour bus ride through a blizzard up to Hetta, well above the Arctic Circle. The driver navigated occasional white-outs and a narrow road covered in snow, ice and tire-chain ruts; each oncoming vehicle made me hold my breath. Aki, the lead dog, is a 40-pound madman. Why come all this way? 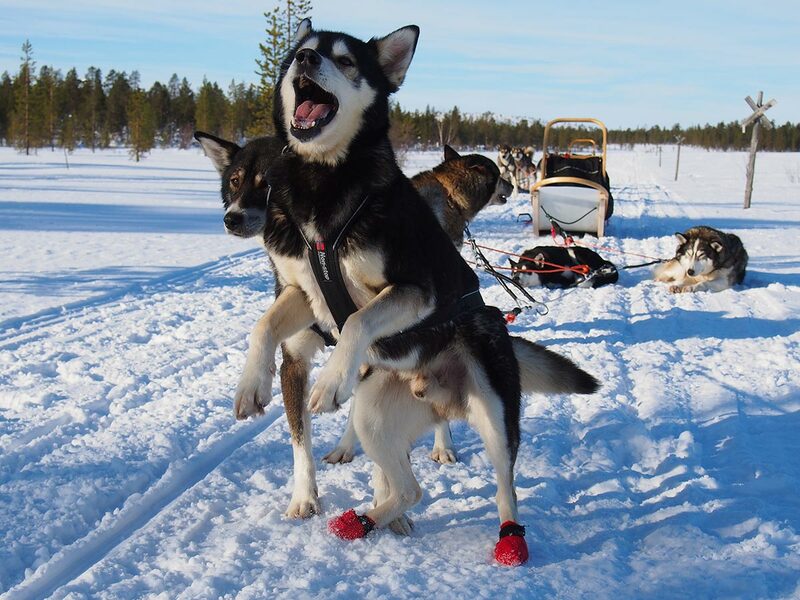 Finland is one of the few places in the world where a mushing operation will allow daring (and usually naïve) novices to drive their own dog teams, a challenge that’s irresistible to me. I prefer expeditions to vacations, physical challenges to relaxation. I immediately bonded with my five dogs—Aki is a 40-pound madman. We connected at a core level. As usual this morning, all the dogs are barking, leaping and raring to go. The phrase “straining at the leash” doesn’t begin to describe the enthusiasm of huskies eager to get on the trail. I pray the snow anchor, a heavy metal hook tethered to the sled that you bury in the snow, holds until it’s my turn to rocket out of camp. Our trek will take us 240 kilometres in five days. Prospective mushers should be fit, able to jog uphill, cold tolerant and prepared, if not necessarily thrilled, to take the occasional spill. The first day our guide, Emily, a hearty blonde from the U.S. with a long braid and a curt manner, gave us a seminar in sledding and hooking up the teams, and we completed test runs near camp. By noon, we were off. The second day we mushed from about 9:30 in the morning until 4:30 in the afternoon. The teams pull at roughly 20 to 30 kilometres per hour, mostly trotting along steadily. The tundra is a boundless white world of rolling snow dunes and stunning panoramas, interspersed with wooded glades and gullies. Crystalline snow blows across the track like sand moving across a beach—but without the warm tropical breezes. Though the biting arctic wind can leave you stiff as a statue, when you’re running behind the sled, you’re sometimes sweating until your long underwear clings to your skin. 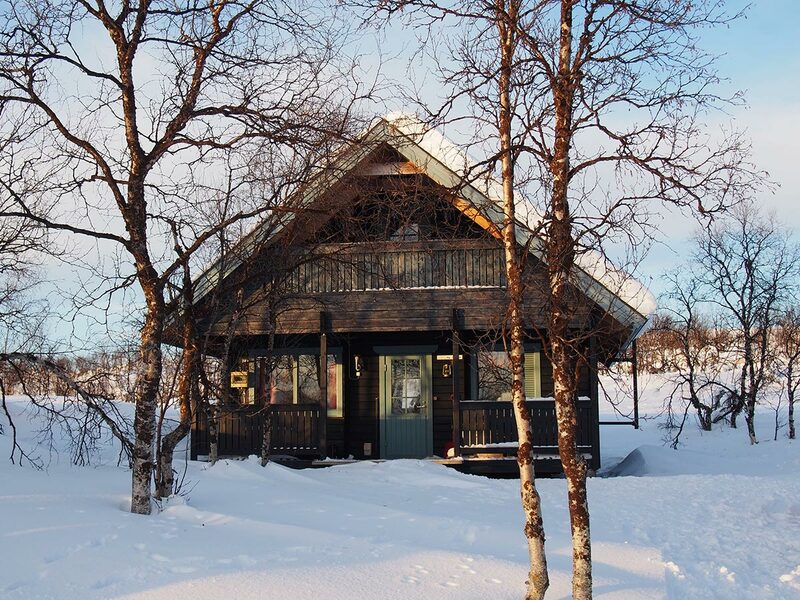 Hetta is far north in Finland’s Arctic Circle, and not easy to reach. Our accommodations are rustic wooden cabins, many heated with wood stoves set up for cooking, no running water, no electricity. Late-night trips to the outhouse, through thigh-deep snow drifts lit by the moon and my headlamp, are part of the fun. Some of the camps also feature woodfired saunas for thawing out; last night’s sauna included an ice plunge cut into a frozen lake just outside its door. Three of us braved the ice bath—my skin tingled as if burned for an hour afterward. Our human group is small, six novice mushers (three men and three women) plus Emily. But the canine crowd is substantial. Seven teams multiplied by five dogs each (plus an extra backup dog for Emily)—that’s 36 high-octane huskies. Pasi Ikonen, co-owner of Hetta Huskies along with his wife Anna, is supporting our trek, following us on a snowmobile taking photographs and pulling a boxy sled, filled with gear and food (for mushers and dogs). Pasi, solid and reserved, is renowned in Finland; in 2008 he and a partner completed the first unsupported trek by a Finnish duo to the South Pole, a two-month Nordic ski journey dragging gear-loaded sleds. He loves dogs and knows how to pull like a husky. Hetta provides all the arctic gear for the dogsled trek: expedition-weight sleeping bags (so warm I have yet to get into mine; I’m using it like a big poufy comforter) and arctic outwear, jackets and bibbed pants, insulated snow boots, thick mittens that reach to my elbows. When you sign up, they tell you what to bring in the way of under-clothing, glove liners, socks and sweaters. Upon arrival, they search your bag for cotton, a controlled and strictly forbidden substance on a polar trek. Accommodations in Hetta are simple but delightful. Cold and day-long exercise builds fierce appetites. Our dinners feature hearty fare, including reindeer stew and elk burgers (spicy and delicious). Pasi serves as chef and bartender in the evenings; last night he broke out a bottle of much-appreciated rum. And he sets up lunch along the trail: soup, sandwiches and tea. In the mornings, we power down coffee, oatmeal, cheese and bread, fueling up before we gas up our vehicles… our 20-paw sled engines. This morning, my stiff muscles ache and my ego is bruised. 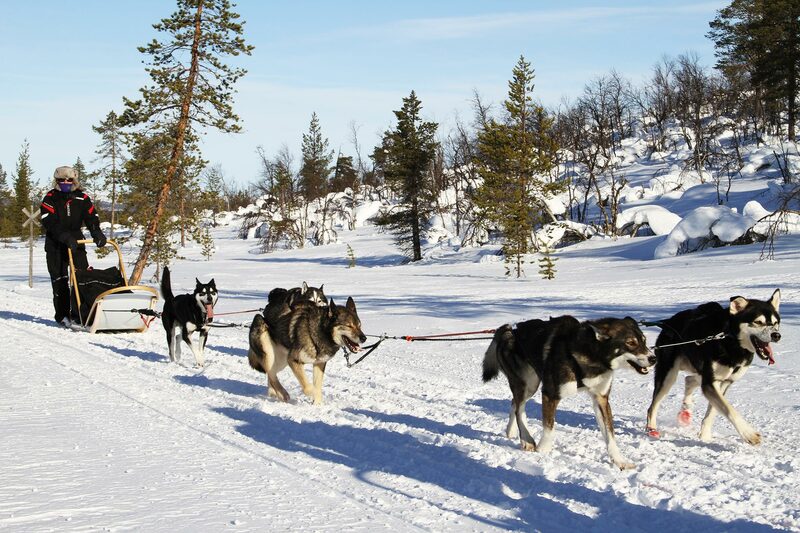 You don’t just ride the rails on the back of a dogsled—on the uphill parts of the trail you run in the snow behind or alongside your sled. So far, we’ve had only snow flurries, no significant new powder. That’s a blessing. The track has been firm and pretty forgiving, but when the dogs pull too far to the side of the track you end up in the soft snow. Aki and my team (the smallest in terms of pooch poundage) were pulling to the left all day yesterday, off into the soft snow, which caused us to fall behind, as I post-holed repeatedly. I didn’t fall or lose my team, but I was strongly encouraged to keep up. By the time we unpacked at the cabin I was physically and mentally spent. My legs were gone, along with my sense of humour. Today Emily is swapping out my other lead dog to counter Aki’s sidewinding, and she’s giving me a bigger middle dog, Carey. He’s the least sociable of the entire pack (at night he’s bedded down well away from the other dogs), and he has a bit of hunchback—Emily says he pulls like a tractor. I like him already. Others in our group have taken spills, lost their teams and been scolded. Rule number one of mushing? Don’t fall off, and if you stumble, don’t let go. The dogs will not stop. They will leave you, lost in the vast white room. And if they catch up to the dogs running in front of them, they’ll fight, a massive ball of tangled cables and sleds, sharp teeth and fur. It took 10 minutes for the fearless Emily to break up one snarling dog pile. Emily (left), the author’s guide in northern Finland. In the forested areas, getting wrapped around a tree is a real possibility—it happened to one of the guys yesterday. Today his shoulder is swollen, black and blue. The good news? The tree he body-checked hooked his sled and prevented his team from running off. On our very first night, we saw the Northern Lights, glowing green in the night sky and morphing into ghostly shapes. And today we’ll pass a large herd of reindeer, perhaps 200 strong. But right now, I’m as tightly wound as Aki and focused on the next couple of minutes. “Yes!” I yell and pull the snow anchor. To get them directed onto the trail, Pasi runs holding my team’s centre cable for five or six strides and then lets them go before they can run him over. With Aki stepping on the gas, my dogs gallop and lunge with every furry muscle and the sled accelerates to what feels like NASCAR speed. I balance on the narrow skids, doing a deep squat to keep my centre of gravity low and back. We navigate two tight turns and then bounce down a short hill and finally onto a frozen lakebed. I gasp and exhale a frosty cloud. Miraculously, I’m still aboard. I straighten up and slightly loosen my death-grip on the sled’s handlebar. My dogs settle into a quick trot, now utterly silent. They’re doing what they love: born to run. Kathleen Doler is an author, journalist and adventure-sports addict. This year, she released her first novel, the critically acclaimed THE HOOK: Surfing to Survive a Shattered Family, Drugs, Gangs and the FBI. She lives in Northern California and writes for national newspapers and magazines on everything from business and finance to helicopter skiing, sea kayaking and scuba diving. She also travels extensively, often while pursuing sports that have the potential to maim her. The dogs “gallop and lunge with every furry muscle.” Great descriptive phrase. I guess more writers should be adventure addicts. I was especially– maybe inordinately — impressed with the horrendous trip it took to get there. Would discourage most, I’d think. I too think this is a great story. But unlike Brian above who says it takes him there and makes him want to do it himself, this took me there and confirmed that I never want to do this myself. 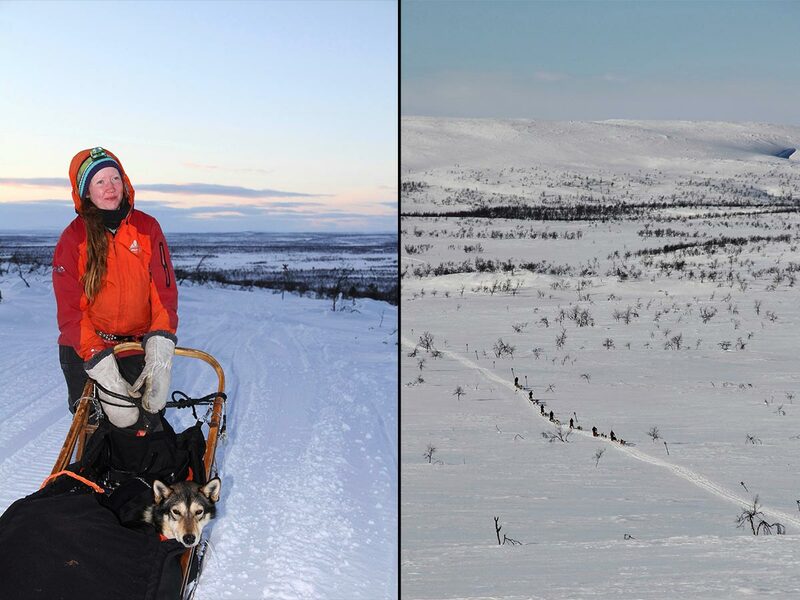 It’s fun though to read how adventurous people can be when they are willing to deal with tough conditions, danger and a well greased dog sled track. I am in Lapland while i am reading your article. Yesterday we had a small tour with hetta husky’s and your article makes me want to book a next vacation solo for a multiple day ride with the dogs! So Thank you dor that. And Thank Anna for the short but great experience yesterday! With the great responsibility (front sled) 😉you gave us, loved it! It is always great to read about our clients’ adventures with us…glad that you loved the experience! Multiday season is just starting here in the far north and the dogs (and guides) are excited to move from the shorter tours to the more interesting trails. Wow! What an adventure! I can almost feel the biting cold and smell the wet dogs. It takes a lot of courage for a novice to trust her safety to a team of four-legged animals. Kudos to the author for taking up the challenge so enthusiastically and allowing the rest of us to share the experience. Reading this article is a blast! It’s like experiencing it myself, but it’s as close as I’ll get to dog sledding! Great article. Well written. it takes me there and makes me want to do it myself! More please!